Tá Eochaill suite cois farraige, áit ina ritheann an Abha Mhór isteach san Aigeán Atlantach. Baile fíor stairiúil is ea í. Bhí sí mar fongfort ag na Lochlannaigh. Ina dhiadh sin, do thóg na Normannaigh fallaí an bhaile, Caisleán Tynte, agus an Túr-Chloigh atá ar chártaí poist na hÉochaille. Bhí mairnéalaigh ag teacht an treo ó thus agus inniu fiú amháin tagann árthaigh isteach lena gcuid lasta agus lónguail. Is anseo i nEochaill go raibh tailte fairsing ag Walter Raleigh. Tá a thigh conáithe le feiscint fós i Sráid na hEaglaise, áit ina bhfuil roinnt crainn iúir fós. Is ón gcrann iúr a fuair Eochaill a h-ainm Eo-choill, nó Yew-Wood. Deirtear gur chum an file Walter Spencer a ceann dá mhór dhánta “An Fairie Queen” anseo. Le tionchar na Gaill agus ina dhiaidh sin, na Sasanaigh, fuair an cultúr iasachta ó Shasana an lámh in uachtar insan mbhaile féin, ní nach ionadh. Fós do bhí ceanntar máguaird laidir sa chultúr gaelach. At thaobh amháin tá Baile Mhic Óda, áit ina raibh an traidisiún an láidir. Ce nár chuala faoi Séamus Mac Muiris Mac Gearailt, Iarla Deasmhumhan. Bhí Baile Mhic Óda ina bhreac-ghaeltacht suas go dtí na triochaidí insan 20u aois. Fuair an cainteoir duchais deireannach Risteárd Ó Drisceoil bás ann i 1994. Tá a gior gharmhac Corán Ó Muiris ag freastal ar an ngaelscoil i láthair na huaire….Sin dúchas agus leanúnachas!! Tá an t-ainm Corán aige taréis Naomh Córan, a bhí ag craobhscaoileadh an chreideamh i gceanntar na h-Eochaille tráth. Deirtear gur anseo a bhí an chéad ollscoil nó coláiste, fé stiuir Naomh Cárán, hence St. Mary’s Collegiate Church. I 1967 ní raibh aon oifig ‘dole’ ar an mbaile. Is amhlaidh go raibh daoine ag teadcht chun conaí anseo de bharr Youghal Carpets agus Murray Kitchens. B’shin nuair gurab fiú pingin nó leathphingin, no feoirling fiú (caithfidh go bhfuil an t-udar seo an aosta!!). Ag dul ar aghaidh chuig na h-ochtaidí taréis titim ollmhór san áit ó thaobh fostaíocht do thosnaigh daoine ag féachaint ar na rudaí tabhachtacha nár choir a scaoileadh uatha. Bhí an creideamh ann ar hdóigh, ach cad faoin gcultúr? Bhuaigh Baile na hEochaille duais náisiúnta Ghlór na nGael i 1975. As san d’fás dhá naíonra lán-ghaelach fé stiúir beirt ó cheanntracha gaeltachta Bríd Bn. Uí Dhuill as Cúil Aodha agus Aingeal Bm. Uí Dhomhnaill ón tSean-Phobal. Taréis mór-chuid cruinnithe chuige bunaíodh gaelscoil i Meán Fómhair 1983, le cathaoirleach cumasach, ciallmhar, an tUas. Liam Ó Laochdha. Ta Liam ag feidhmiú fós mar Phríomh-Oide Tainisteach i gColáiste Eoin, áit ina bhfuil Aonad lán ghaelach. D’oscail dóirse na scoile (ní raibh aon geata ann) ar an 5.9.1983, le príomhoide nua cheaptha Seán Ó Murchú, as Fionn Trá is gCorca Dhuibhna, le cúntoir Siobhán de Paor as Cathair Phort Láirge. Bhí tosnú an-láidir déanta le 32 páistí ar rollaí na scoile agus i bhfoirgneamh a bhí cluthair i sean-cheard scoil i Sráid na h-Eaglaise. Seachas ábhar acadúla, cuireadh an bhéim ar chursaí drámaíochta insan scoil. Tá coirm cheoil ar siúl gach uile bhliain ó 1983 gan briseadh. Éacht ann féin. Le béim ar imeachtaí stáitse, d’ullmhaigh muinteoirí eagsúla iad le haghaidh Slógadh, i gcór, scéalaíocht, bailéad-ghrúpa, ealaoín agallamh beirte srl. Bhí mór chuid taisteal, am agus reamh-ullmhuchár ag baint leis seo le craobhacha aitiúla, réigiunacha agus náisiúnta. Do thug an scoil Craobh na h-Eireann abhaile leo ón Muileann gCearr agus as Inis dhá bhabhta i gceoldrámaíocht agus i rince seit. Gach moladh tuillte ag an bhfoireann teagaisc a d’ullmhaigh iad, don taisteal ,féitheoireacht. Spreag na h-imeachtaí seo gach éinne agus deineann fós. Sé Coirmcheol na Nollag croí le cursaí dramaíochta insan scoil agus cuireann an fhoireann teagaisc an chuid fuinneamh agus am isteach ann. Tá an bhéim ar chursaí freisin, agus mar ghaelscoil faigheann na cluichí gaelacha tús áite. Teánn mórchuid ama, airgead, agus allas isteach sa chúram. Tá toradh air seo, áit inar bhain an scoil craobh an chonrtae amach deich bhabhta le blianta baga anuas, idir peil, iomanaíocht, sacar agus camógaíocht. Ó thaobh cúrsaí spóirt do bheadh sé deacair é sin a sharú. “Mol an Oige” motto na scoile agus tá seo le feiscint i réimse leathan a nchuraclam mór thimpeall na scoile. Bionn béimn ar chursaí rince agus ealaíon freisin, leis na páistí páirteach i gcomortaisí scoile, áitiúla agus náisiúnta. Tá ranganna giotár ar siúl sa scoil le fada agus éileamh mór orthu. Faigheann na páistí ceachtanna snámh chomh maith i luthchleasaíocht agus rugbaí. Nár bhrea an lá a bheith ar ais ar scoil an seo mar dhalta!! Chuaigh an scoil ó neart go neart le rang iomlán ag teacht isteach gach bliain, agus múinteoir a cheapadh gach bliain freisin. Bhí ós cionn 250 dalta le hochtar múinteoir ag freastal ar anscoil i 1992-1993. Chuir san an bhrú ar gach éinne mar ní raibh cúrsaí cóiríochta oiriúnach don slua mór a bhí ag freastal ar an scoil. Taréis comhnascadh isir na scoileanna áitiúla, do chiur an Roinn Oideachais foirgneamh Scoil na mBraithre ag fáil i 1997. Do thug Uachtarán na h-Eireann cuairt ar an ngaelscoil i 1991. Fuaireamar misneach agus spreagadh uaithí mar go labhair sí go láidir, óna croí, faoin teanga agus an culture gaelach. Do chuir gach éinne an chuid fuinneamh agus smaoineamh isteach sa scoil, tuistí, múinteoirí agus cáirde na scoile. Níl amhras ar bith go raibh ról fíorthabhachtach ag Cathaoirleach na Bhoird, sé sin an t-Uas. Liam Ó Laochdha. Bhí sé a lár an aonaigh, nó i lár na páirce, mar Chathaoirleach an feadh ceithre mbliain deág. Is iomaí faidhb a bhí air réiteach. Do thug sé mór chuid ama don scoil, mar Chathaoirleach ar an mBord Bainistíochta agus mar thuiste chomh maith. Do dhein sé gach rud go fial agus go fonnmhar. Míle buíochas duit a Liam, agus duitse a Mhaighreád mar go raibh Liam ar iasacht ag an scoil don tréimhse sin. ar Áras an Uachtaráin agus bhuaileamar lenár nUachtarán Mary Mc Aleese. (Máire Mhic Giolla Íosa). I lathair na h-uaire tá seachtar déag múinteoir, runaí airíoch agus cuntóirí ranga ag feidhmiú insane scoil. Táimid lán go doras o thaobh daltaí de, Buíochas le Dia. Cuireadh ‘feachtas foirgneamh’ ar bun @2010, fé stiúir Cathaoirleach an Bhoird Bainistíochta, Seán Ó Brosnacháin. Deineadh each tag bheagán airgid agus bhí lá iontach again nuair a d’oscail Uachtarán C.L.G. Críostóir Ó Cuana na seamraí nua i Márta 2012. Ó thaobh tír-eolaíochta de ní hamháin go bhfuil an Ghaelscoil lonnaithe cois na sáile, tá Gaelscoil Choráin lonnaithe cois na habhann chomh maith. Tagann an taoide agus an Abha Mhór le chéile ag bualadh fallaí cosanta na scoile de shíor. Suíomh nádúrtha atá deacair le sharú. Ní amháin gurab i Gaelscoil Choráin an scoil is congaraí don bhfarraige i gCorcaigh Eirinn (seachas an scoil ina ndeineann Fungi freastal air!!) tá ár scoil níos congaraí don bhfarraige na aon scoil mór thimpeall an Domhain Mhoir. Tá sé ar chumas an mhuinteoira agus an dalta breith ar bhradán, í a scoilteadh, í a róstadh gan corraí ón scoil. Athchursáil nadurtha leis na cnámha ina dhiaidh san. Comhthathí!! Tríd is tríd, tá ag eirí linn. Déinimíd iarracht ar leith an scoil a ghaelú chomh mór `s is féidir linn. Cinnte bíonn ar ndaltaí líofa insan dara teanga ag fagaint na scoile. Deintear é seo cheiliúradh nuair a fhagann Rang VI, áit go bhfaigheann said an Fáinne Airgid. Eochaill Abú. 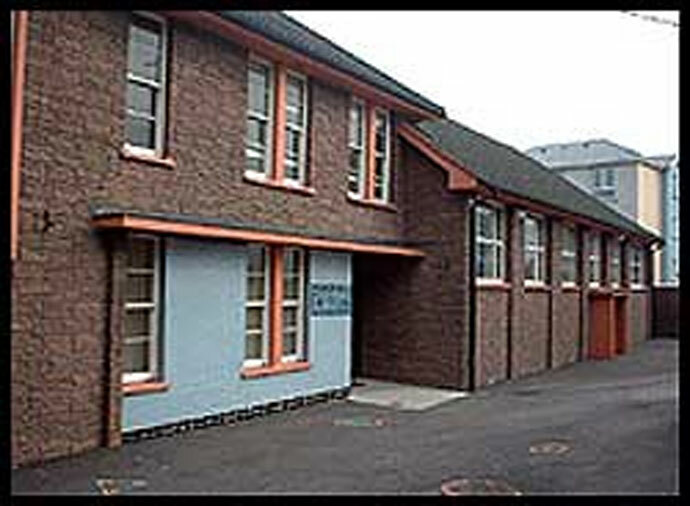 Gaelscoil Choráin was established in 1983. It was the first primary gaelscoil to be formed in Cork county, apart from one or two modhscoil that were in existence since the 50’s. The school name celebrates a local saint, St. Coran, who studied and resided in the Youghal area in 800 A.D. Great credit is due to those involved in setting up the gaelscoil, and those first parents who enrolled their children, taking a great leap of faith into the unknown. Our original school building was in Church St. in the premises of the former Vocational School, which was the precursor to Coláiste Eoin. It was an appropriate site historically because within yards of the school was St. Mary’s Collegiate Church, which was an esteemed learning centre in the ninth century, where St. Coran and St. Declan are reputed to have studied. We were fortunate to have a solid base, albeit basic, and the rooms were warm and well insulated. In hindsight it was an unique location steeped in history, with both young and young at heart forming part of the little streets community. 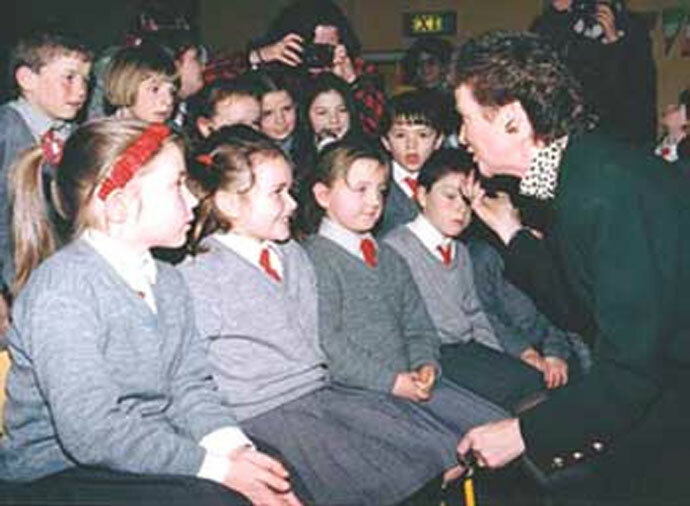 One of our greatest memories from that time, was when newly elected president, Mary Robinson, visited our school in 1992. She made a lasting impression on those present, speaking at length on the importance of our culture. As the school attendance numbers grew however, it was clear that a new and more appropriate premises was needed. We were fortunate indeed, to get an opportunity to move to the building in Strand Street, where the Christian Brothers has promoted education and Irish Culture for many years. In 1997, school life began in our new abode, and with proper educational facilities, the school went from strength to strength. Though we take things like a school yard, hall, proper toilet facilities and a safe environment for our children’s education for granted nowadays, it is appreciated all the more by those who strove for such vital amenities. It was a cause of great celebration when the Minister of Education, Michéal Martin, officially opened Gaelscoil Choráin in its new permanent site in Strand Street in June 1998.